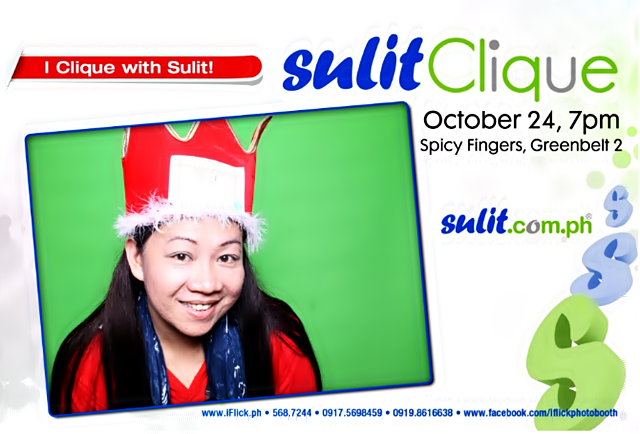 I was one of the bloggers who were invited by Sulit.com.ph to their first ever Blogger's event held last October 24, 2012 at Spicy Finger's in Greenbelt in Makati. It was raining that day and I just came from two earlier events. Greenbelt is three hours away from home. That includes lining up at the MRT and walking from Ayala MRT station to Spicy Fingers for like twenty minutes, depending on how fast you walk. I don't want to proceed anymore to the venue but I already confirmed my attendance to Ms. Rachelle so for the sake of mutual respect and word of honor I walk and walk until I reached Spicy Fingers. I then registered, and enter the venue. I hardly ate because I was so full already from an earlier event that I attended. Next time round, I will reserve some space for the great food selected by Sulit. Good thing, Sulit had a photo booth and everybody had fun posing. Each one of us lined up, pose and had our pictures taken. We also participated in a game, where we had to turn the tarpaulin around. Each group is consists of 5 members each. We called our group sulit. We did not win but we're happy that boy kuripot's team won. Even if we did not win anything, we felt happy because we get to play and had fun with other bloggers. Ano ang hanap mo? You can find everything at sulit.com.ph. That's a fact. My blogger friend Blanca won an Ipad during the raffle draw. I was misty eyed because I know that Blanca deserves the Ipad because her husband had just passed away and she hardly attend bloggers events since her husband had passed away. We were also amazed by the story behind sulit.com.ph. The amazing couple Rj and Arianne David conceptualized their business inside Rj's room when they were still bf-gf. They are now married and amazingly turned sulit.com.ph into a multi-million business. Filipinos are really talented. The founder of sulit deserves a commendation and I think they should write a book and I hope that the book will be taught at business school or even in high school. Because that way, they can inspire other people to never give up and go for their dreams.